Recently I was asked, what makes a Performance piece special? What gives us this tingling sensation like an army of ants, the excitement in the stomach, the amazement as you see something you have never seen before? What hits us in the heart, the face, and makes an image lasting far longer than the Performance itself? What leaves this unique impression, we can’t describe with words? Well, it all has a beginning, but beside many other aspects, at the end it all arrives in one point; in a SITUATION. For example the moment, in which two glasses suddenly collide and splinter in thousand pieces or the moment we witness the shaking muscles of a performer so intensively, that we can feel the tension in our own body. If we talk about bodies, visuals, environments or the audience, we speak about moments, magical, intense, irritating. For me, this is the essence of (Performance) Art. Here it all begins and ends: with a timeless moment. 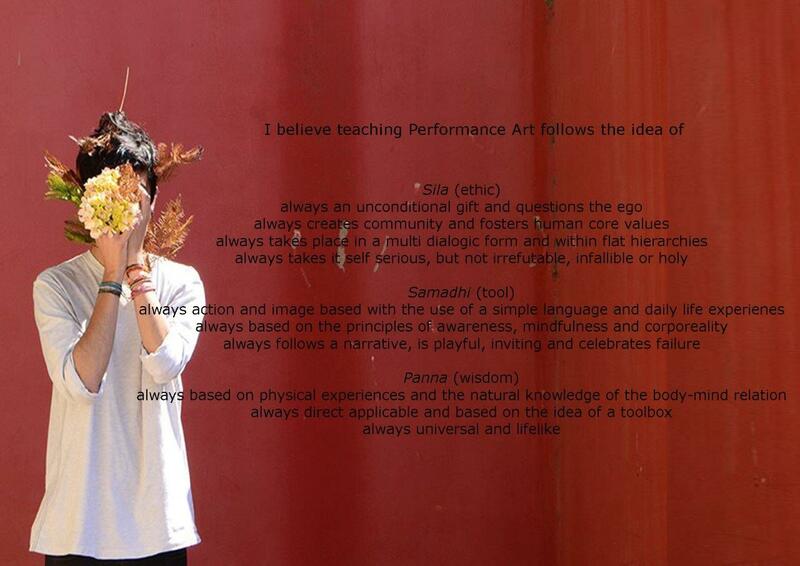 That is why I certainly believe and insist it is possibe to teach Performance Art. That is why I am convinced of the importance of Performance Art as a medium with a strong actuality, directness and urge to share emotional, political and social equality. Therefore I believe in Performance Art as an viral articulation of free expression of mind, soul and heart.